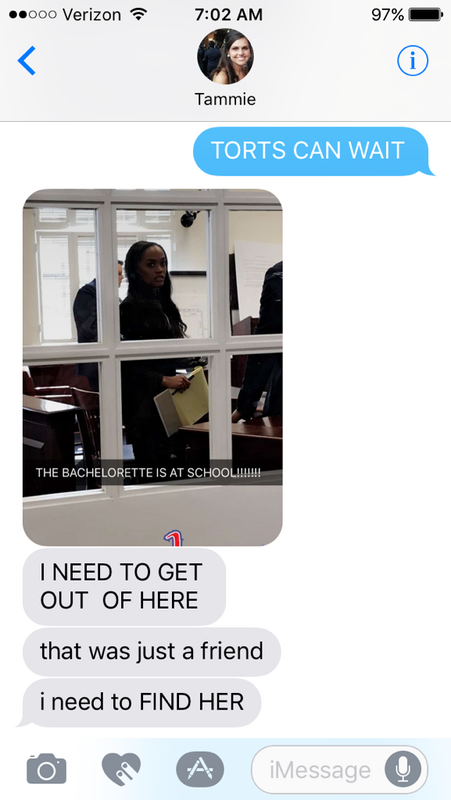 Exclusive Behind the Scenes Photos of Rachel as The Bachelorette — deep hunger, deep gladness. RED ALERT, RED ALERT, CHECK IT. Okay so my really great friend Tammie Beassie Banko (who I will refer to as TBB from now on as it is swaggier and also what I actually call her) is a law student at SMU in Texas. I would like to include a transcript of our texts from a few days ago, as that will really be the better way to tell this story. I will also be redacting my horrible trucker mouth because in my real life I am a disgusting sailor. Anyway this was basically the best day ever. HAPPY WEEKEND!